where promises have been given, and afterwards denied or ignored, the theatre upon whose stage the political actors have played their parts publicly, while behind the scenes were wire pullers who were manipulating the wires, causing the actors to play their parts automaton like, while those who made no public display of their designs were carrying out a special programme, not advertised on the bills. All these things have transpired in Horseheads, giving her a name to be long remembered by those who have been upon the political stage or behind the scenery. Horseheads has also been distinguished as a great social center, four hundred couple assembling in two halls, and enjoying the innocent and healthful exercise of dancing. Its citizens have been enterprising, establishing churches, schools, lodges, aiding in the construction of canals and railroads, and otherwise demeaning themselves with distinction as citizens of the great state of New York. 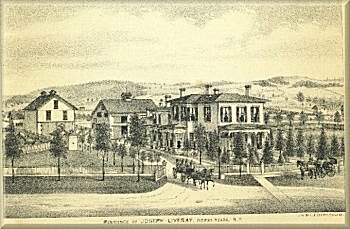 The village was first incorporated as Fairport, in May 1837, and in 1845 by an act of the legislature it was designated as Horseheads, and in 1885 was change to North Elmira. The town of Horseheads was formed from Elmira, Feb. 8, 1854, and on the 14th day of the same month as election was held at the house of Waterman David for town officers. Samuel H. Maxwell was elected supervisor; Ebenezer Mather, town clerk; Hiram S. Bentley, superintendent of common schools; David Edwards, Joel Heller, George H. Taylor, justices of the peace; John Ross, Lewis Carpenter, Daniel Bennett, assessors; Joseph Rodburn, commissioner of highways; David P. Breese, collector; William Reynolds, Abner K. Shappee, overseers of the poor; David P. Breese, A. D. Loomis, Moses P. Breese, Asa J. Jackson, Hiram H. McConnell, constables; Lewis H. Turner, Zeno Carpenter, John C. Jackson, inspectors of election. Horseheads is bounded on the north by Catlin and Veteran, east by Erin, south by Elmira, and on the west by Big Flats. The Utica, Ithaca and Elmira, R. R., the D. L. & W. R. R.., the N. C. R. R., and the N. Y. L. E. & W. R. R. pass through the township. The principal stream in Newtown creek, which flows from the northeast, and thence south through the town. It is one of the most ferticle and productive townships in the county. Early settlers: Samuel Tubbs, Phineas Stevens, Lebbeus Hammond, John Breese, Asa Gildersleeve, John Winkler, David Powers, Christopher Van De Venter, Jonathan S. Conklin, Jonas Sayre, Ebenezer Sayre, John Sayre, Vincent Conklin, Brinton Paine, Morderica Rickey, John Ten Brook, Gersham Livesay, John Jackson, Darius Bently, Paris Green, Rev. James Taylor, Joseph McConnell, John McConnell, Daniel Carpenter, Richard Hetfield, Levi Maxwell, Josiah Maxwell, David Shappee, William Rockwell, John C. Wannamaker, John Hathorn, Nathan Teal, Alexander Miller, William Seeley, Jacob Westlake, Stoddard Conklin, Capt William Hull, Abel Shute, Benjamin Smith, Charles W. Dunn, Caleb Bentley, Henry Wisner, John Parkhurst, George Payne, Charles Maxwell, Holmes Hutchinson, Silas Clark, William Hastings, Dr., George Whiteman, Peter Hastings, Theodore Valleau, Benjamin Westlake, James Taylor, Obediah Thorne, Orris Eddy, Israel Boyer, A. Scoonover, John N. Barbour, John Acmoody, Silas Breese, Willis Sayre, Walter Dailey, Sr., Samuel Westlake, John Westlake. --Solomon More built the first tannery in 1808. --The first tavern was opened by Vincent Conklin. --Pioneer Hose Company, organized December, 1873. --The first saw mill was built by Nathan Teal, in 1804. --The first death was Susannah Conklin, March 3, 1793. --The first grist mill was erected in 1798, by John Breeze. --Horseheads Fire Department, incorporated June 2d, 1876. --Sarah Breeze born Feb. 18, 1789, was the first child born. --The first church was erected in 1832, by the Presbyterians. --The first school was taught by Miss Amelia Parkhurst, in 1793. --The Chemung Patriot, a weekly paper established by J. T. Bradt. --In 1855, the boundaries of the village of Horseheads were enlarged. --Rev. Daniel Thatcher, a presbyterian, preached in Horseheads, in 1801. --The first marriage was that of William Dunn and Mercy Sayre, in 1790. --William T. Hastings, from Horseheads, represented Chemung county in 1857. --In 1855, Samuel C. Taber issued a weekly newspaper entitled "The Philosopher." --Horseheads Journal, a weekly newspaper, was issued May 15, 1866, by Clizbe & Hinton. --In 1856, The Chemung County Republican a weekly newspaper was issued by Flores B. Plimpton, Esq. --Great fire in Horseheads August 12, 1862. Almost the entire business portion of the village was destroyed. --Horseheads Chapter, R. A. M., No. 261, was instituted April, 1871. Charter members R. P. Bush, M. P.; Calvin Eddy, E. K.; S. A. Palmer, E. S.
--The Presbyterian Church was organized Feb. 8, 1832, with twenty-four members. Theodore Valleau, Hector Sayre, Myron Collins were the first elders. --Horseheads Steamer and Hose Company, No. 1, was organized August 22, 1873, with John W. Lovell, foreman of Steamer; Richard Donovan, foreman of Hose. --Hon. Jacob Westlake, of Horseheads, was an assemblyman in 1833, before the county of Chemung was erected. He was the first assemblyman from Chemung county, in 1837. --Acme Hose Company, No. 2, organized November 14, 1877. Chas. Whitney, Foreman; Frederic F. Herrick, Recording Secretary; Edward H. Fleming, Financial Secretary; Darius Smith, Treasurer. --In 1854 the Horseheads Building Association was organized. Comfort Bennet, Pres; Willis B. Sayre, Vice President; Hiram S. Bentley, Secretary; Charles Hulett, Treasurer. The company erected a large brick block in 1855, which was destroyed by fire in 1862. --Methodist Episcopal Church was organized in 1815. Benjamin Westlate local preacher. Among the first members were Benjamin Westlake, Samuel Westlake and wife, Hannah Shute, James Taylor and wife, William F. Hull and wife, Obediah Thorne and wife, David Holmes and wife, Lanah Westlake, Phillip Smith. --George Bennett was county clerk in 1864-7. --William R. Breese built the first store in 1855. --Joseph Rodburn built the first grist mill in 1860. --Walter L. Dailey was the district attorney, in 1872-4. --Baptist church organized in 1828, as a branch of Horseheads. --Peter Wintermute, of Horseheads, member of assembly in 1859. --Joseph Rodbourn was superintendent of the poor for many years. --Albert A. Beckwith, of Horseheads, was sheriff from 1837-1840. --Post office established at Breesport in 1852; Warren Lincoln, postmaster. --William T. Reeder, of Horseheads, was sheriff of Chemung county in 1849-52. --Horseheads free school established October 11, 1865. Academic department added in 1877. --Chemung County bank was established at Horseheads by William T. Hastings, Nov. 1855. Capital $50,000. --St. Peter's and St. Paul's Catholic church erected in 1865, by Rev. Father Cavanaugh - consecrated in 1866. --John Jackson, of Horseheads, was sheriff of Tioga county, in 1834 to 1837, and of Chemung county from 1837 to 1840. --Chas Hulett was member of the assembly in 1862. Member of the Baltimore and Charleston National conventions, in 1860. --Methodist Episcopal, Breesport class, was organized in 1839; Isaac VanGorden, leader. Church erected in 1852; Rev. M. Beach minister in charge. --Horseheads Lodge, No. 364, F. A. M., organized Feb. 1, 1855, James A. Christie, W. M.; O. D. Chattfield, S. W.; James Barlow, J. W.; Adam L. Staring, Treas. ; Hiram S. Bently, Sec. ; John Bachman, S. D.; John N. Beers, J. D.
--Horseheads Grange, No. 105, organized February 18, 1873, H. M. Van Duzer, Master; Chas. K. Hetfield, Overseer; James McQueen, Treas. ; J. F. Westlake, Sec. ; Mrs. Samuel Marshall, Ceres. ; Mrs. Wilson Rickey, Pomona; Miss Kate Van Duzer, Flora. --The first canal boat was built by John Jackson, and was ready for launching when the water was first let into the Chemung canal. It was used on an excursion in the celebration of that event, where canons were fired, a band of martial music employed, and a grand time generally had. --Baptist church, Rev. Roswell Goff and Rev. Philander D. Gillette were the early Baptist ministers, and Goff commenced his labors here and elsewhere as early as 1805; Rev. Gillette about 1825. In April, 1840, a church was organized by Rev. Aaron Jackson. Among the members were deacon Joseph Smith, John Tenbrook, Ebenezer Mather, Increase Mather. --Protestant Episcopal church was organized in October, 1862, through the efforts of Samuel H. Maxwell, Mrs, Nathan VanDuzen, Mrs. Fanny Sayre, Mrs. A. H. Judson, Stephen Johnson, Rowland Parker. A brick church was erected and consecrated by Bishop Coxe, October 8, 1867; Rev. H. M. Brown, rector. took a team, went to Blossburg before there were any bridges across the Canisteo or Tioga rivers, obtained a wagon load of coal, and sent it to Albany in a wagon, for the inspection of the committee upon canals, and legislators generally. Captain Conklin is still living at this time, March 20, 1885. --Breesport was laid out in 1854, by Azariah Breese. It now contains about seven hundred inhabitants. The Chemung County Poor House is located at this point. The shops of the Utica, Ithaca and Elmira Railroad were located there immediately after the completion of the road. It is the home of Joseph Rodbourn, a prominent business man, who was instrumental in building up the village; was the projector of the railroad, and by his energy, skill and enterprise, it was successfully completed. He was the first president of the road. --Horseheads, for many years under the old militia system of the state, was the place where "General Trainings" were held, in the meadow upon the farm of the late Col. Henry C. Hoffman. A writer speaking of one of these old "General Trainings," says: Across Newtown creek from where I stand on lands now owned by Col. H. C. Hoffman, was the spot, where from all sections of Chemung county assembled annually the rifle companies and militia to drill according to Scott's Manual. At that time several revolutionary soldiers were living in the county, and quite a large number of soldiers of the war of 1812, who generally were present and inspired a martial spirit in the breast of the riflemen, militia and officers. The men were then living who had taken part in the battles of Lake Erie, Lundy's Lane, Plattsburg, New Orleans, and the music performed by the martial bands, was the same as played during the triumphs of Commodore Perry, General Scott and the hero of New Orleans. At these general musters the prospective and ideal enemy was the Red Coats or British, and every manouver was studied with an idea of how to parry and ward off the blows, or elude the shot or evade the charge of the English soldiers. Forty-six years ago I stood on this very spot, and with breathless anxiety watched the parade, the drill and military evolutions. There were probably five hundred men drilling, a host, in my youthful mind, sufficient to repel the armies of Great Britain or France. With what eagerness I watched the manouvers of the cavalry, the exercise in the manual of arms, by the infantry and their charges with fixed bayonets, and listened to the shrill blast of the bugle, the inspiring notes of the fife, accompanied with beats in perfect time of the snare and bass drums. These things inspired me with the greatness, strength and powers of the American soldier, and furnished me with topic for elaboration among the less fortunate boys of my neighborhood, when I returned home, for weeks thereafter. It set me to practicing with flail staffs, pitchforks, corn-cutters as imaginary guns, sabers and bayonets, and Don Quixote like I was ready to attack any object which came in my way.